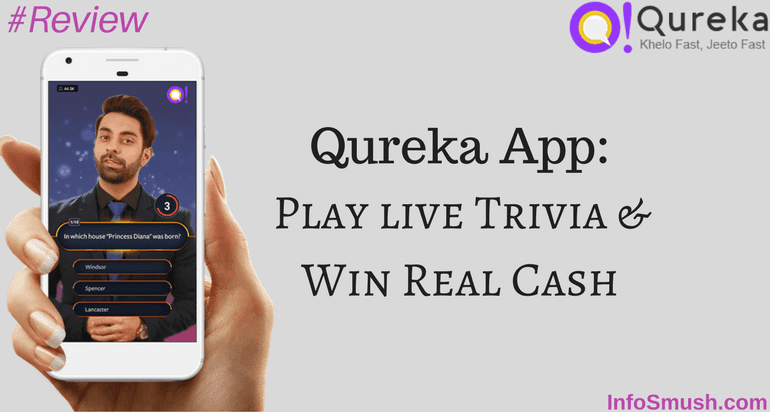 Qureka is a live quiz app where you can play live quizzes for free and win real cash prizes. Every day you can win Rs.50,000 or more just by answering questions. Register with this referral code- HIMA3525 to get 2 bonus lives-Now Coins(more about coins later in this review). Now, you can play a quiz when it's live. Like I mentioned above Qureka is live trivia game show app. So, you can only play the game when it's live. And yes, there is a live host. To win the cash prize you just need to play the game show and correctly answer all the questions. Questions can be related to many categories including Bollywood, GK, Television, Trending, Music, Technology, and Geography. Every day Qureka hosts many shows throughout the day with different prizes. Prize Money for each Quiz contest vary but the quiz at 9PM has the highest prize. The game show has 10 questions and each question has 3 options. You will have 10 seconds to choose the correct option for each question. Answer all 10 questions correctly to win the prize. In case there is more than 1 winner the prize money will be split equally. Qureka also pays the top 3 fastest winners additional Rs.10-1000 depending on the prize money. You can also play Monthly Mega Quiz on the last day of the month at 8:30 PM(timing may be different). The prize money for this quiz is Rs.10 Lacs. Mega Quiz prize is transferred to your Bank Account. You have referred 3 or more friends in that month. You have won any one game in the given month. The mini quiz runs multiple times every day. These quizzes have 3 questions. Answer all 3 questions correctly and you get coins. 1. You get 3 questions per game to answer correctly. 2. For each right answer you earned 10 coins. 3. You can watch a video after the Mini Quiz and earn extra coin. 4. No coins are applied in case of wrong answer in the mini quiz. You will get Rs.10 Paytm cash for each friend who joins Qureka using your referral code and plays at least one game. You need a minimum of Rs.30 in your referral wallet to be able to transfer the amount to Paytm. You and your friend both will get 60 Coins when they use your referral code. Enter this invite code HIMA3525 to get 60 bonus Coins. Best Part: If your referral wins, you will get 50% of the prize. It does not mean that your friend gets 50% less. He will keep the prize. Qureka will just gift half of the prize your friend won to you. But to be eligible, you must have played the quiz that your friend won. For example; if your friend won the 2:30 PM quiz, you also must have played the quiz to get your 50%. Special Live Quizzes with coin entry will require you to have sufficient coins in your wallet to join the quiz. In case of insufficient coins, you may do activities like watch videos, invite friends and play main and mini quizzes. Keep a spare coin in your wallet for prevention from elimination during the games too. CoolBoots Media, the developers of Qureka launched GameChamp- an application where users would win Paytm cash by playing games(like MPL)- a few weeks ago. But they soon terminated the app and launched a new one- Qureka pro. Qureka Pro is similar to GameChamp. But to join cash tournaments you'll need cash. They added a Brain Game section in Qureka app. In this section, you can join game-tournaments and win Paytm cash. You can use coins to pay the entry fee.